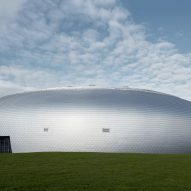 Reflective aluminium panels cover the rounded shell of this school sports hall near Prague, helping to disguise its scale. 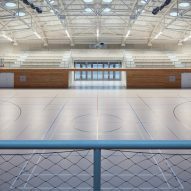 The sports hall, designed by local architecture office Sporadical, adjoins a recently modernised and extended primary school in the town of Dolní Břežany, to the south of the Czech capital. 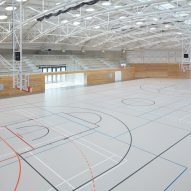 In addition to providing a space for the school's physical education classes, the hall can be used by the public for sports and as a cultural venue. 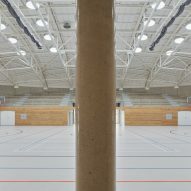 Situated on the edge of the town, in an area that is currently undergoing redevelopment, the sports hall's position and orientation on the site are designed to ensure it feels connected to both the town and the school. 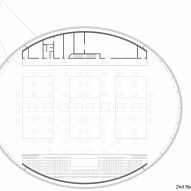 According to the architect, the building's ellipsoid form gives it a distinctive contemporary presence that is neutral enough to complement the evolving urban context, while also disguising the overall mass of the building. 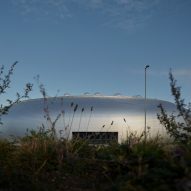 "The dome draws the scale closer to humans, the metallic surface mirrors the surroundings, while the borders of the sky and of the roof remain blurred," said the architect. 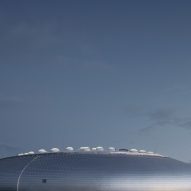 "The building camouflages its real dimensions and looks smaller than it is in reality." 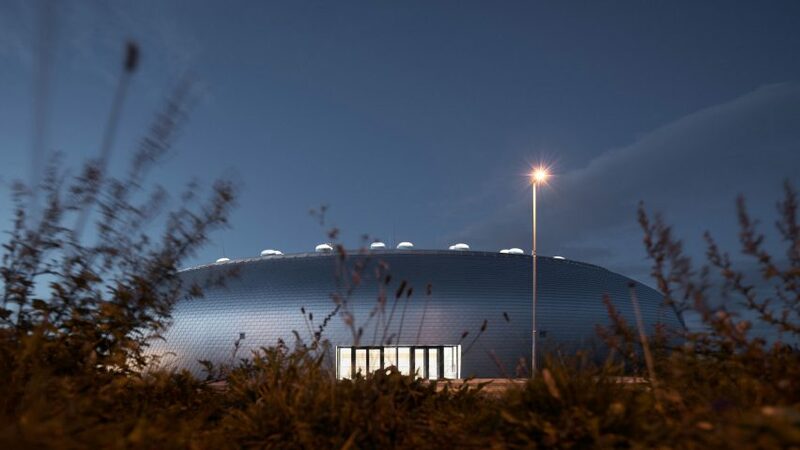 The aluminium shingles applied to the building's exterior create a smooth and seamless surface that produces gentle reflections. 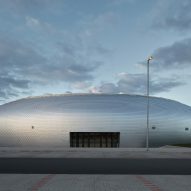 This cladding is affixed to curving walls made from load-bearing reinforced concrete. 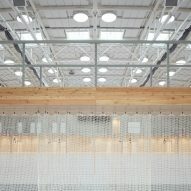 A latticed steel frame, featuring arching trusses that span up to 44 metres, encloses the column-free interior. 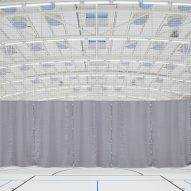 A section of the roof is covered with a waterproof membrane, perforated by 68 light tubes that funnel daylight into the sports hall. An artificial lighting system linked to sensors enables interior light levels to be automatically regulated throughout the day. 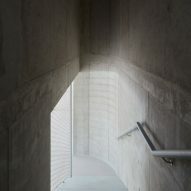 The main entrance to the building is a rectangular aperture perpendicular to the street and parking lot, while a corridor links the sports hall directly to the school. 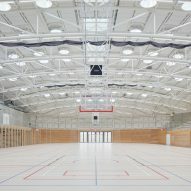 The interior is designed to complement the new school buildings by adopting a similar material palette. 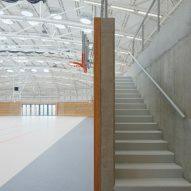 White and grey surfaces are combined with larch cladding, which contributes to the carefully considered acoustics. 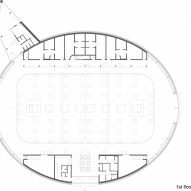 Changing rooms with toilets are positioned along the side of the building adjoining the school, with a machine room and offices accommodated on the first floor. 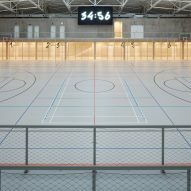 On the opposite side of the hall are more public facilities, including a grandstand for 250 spectators. A gangway connecting either side of the grandstand spans an entrance vestibule accommodating a snack bar. 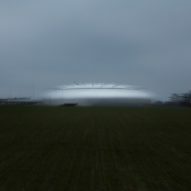 Beneath this grandstand are technical spaces, including storage rooms for sports equipment. 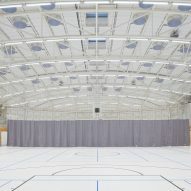 Curtains suspended from tracks integrated into the roof can be used to divide the hall into three sections that are each large enough to accommodate a volleyball court. 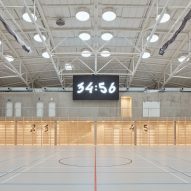 Local graphic design studio Les Kanců developed a bespoke signage system comprising pictograms and numbers, which is hand-painted onto the structural concrete walls. Photography is by Jakub Skokan and Martin Tůma/BoysPlayNice.